The doors that are used in residential garages vary widely all the country. There are doors that are made entirely of wood. There are doors that use molded and sectioned metals. Other doors are made entirely of glass while still many others are a composite of 2 or more materials. It comes as no surprise then that these doors can weigh in excess of 150 pounds or sometimes even more than 200 pounds. Though these doors are very heavy, there is a sort of magic happening right above our heads that allows us to lift them with relative ease. This ostensibly magical effect is afforded by one or more very important components: garage door springs. Thanks to their strength and durability, they make it possible for just about anyone to easily raise a 200 pound door. However, because of this, their absence or destruction can result in a dangerous situation. 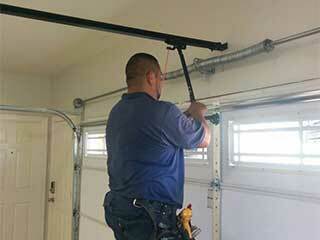 Torsion and extension are the most common types of springs used in garage door systems. Extension being the older of the two, it uses stretching and contracting in order to harness the energy necessary for the door's function. Torsion, on the other hand, which is the more modern variety, utilizes a twisting motion, which takes less of a wear-and-tear toll on the component, and is the reason why springs of this type are considered safer and tend to last longer. When you have a broken spring, your system can become virtually inaccessible. This can be a major hassle if it happens while your car is still inside your garage. You may think that you'll be able to replace the springs on your own but such a misguided attempt can be downright fatal. Springs are extremely dangerous to handle without the proper training, and should only be attended to by expert professionals. Allow our expert technicians at Garage Door Repair Encinitas to help you out. We'll replace any problematic spring, and we'll also make the right adjustment to keep the tension level optimal and prevent the door from tilting or potentially collapsing.